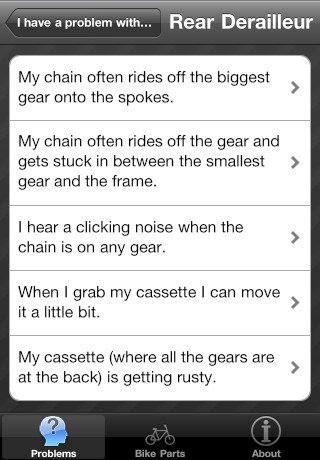 Bike Repair for iPhone, iPod Touch and iPad is a reference guide to help you fix 34 bike problems. 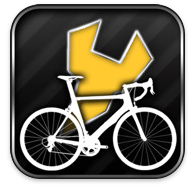 Riders identify the problem area(s) on their bikes, pick the appropriate bike part, chose the problem and follow the step by step solution to fix or adjust the problem area. 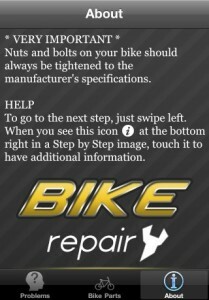 Most of the solutions have high quality photos with instructions and part identifications to help you repair your bike quickly and easily. 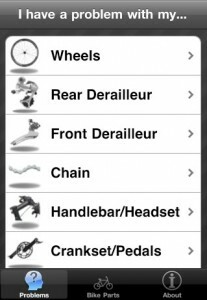 The problems section covers: wheel, rear derailleur, front derailleur, chain, handlebar/headset, crankset/pedals, brakes, disk brake, shifter, suspension and others. 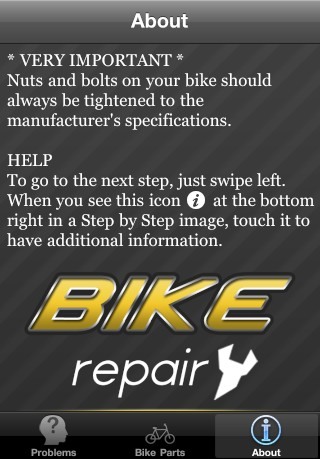 Bike Repair also has a list of bike parts and it notes maintenance for each part (just in case you haven’t experienced a problem in a specific area, yet). 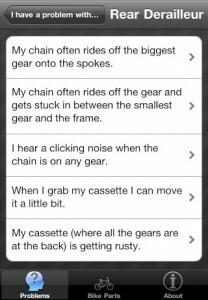 The only thing missing is a preseason/pre-ride tune-up checklist to help you have a better ride. 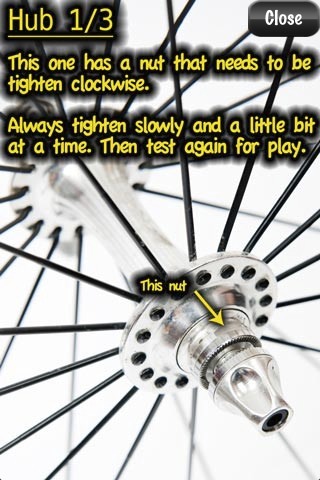 The best things about Bike Repair are that you don’t need to be connected to the internet to get solutions to problems (information and solutions are stored on your device) and the solutions presented contain a few simple phrases and tasks that make it easy to fix your problem. 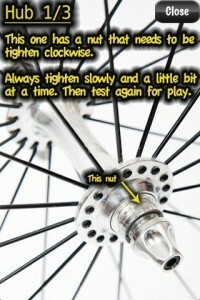 Bike Repair is just like carrying your bike manual to help diagnose problems that can and do occur. 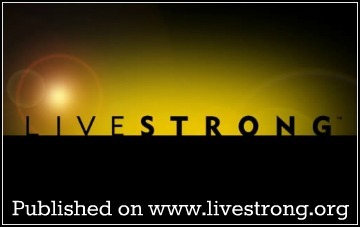 Available in the iTunes App store for $1.99. 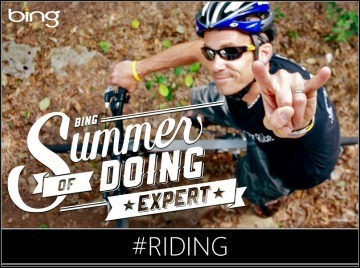 That’s a pretty cool app. Is it only pictures or does it utilize video too? Solutions are only in picture form…I never even thought of using videos. I’ll pass your comment on to the app developers. 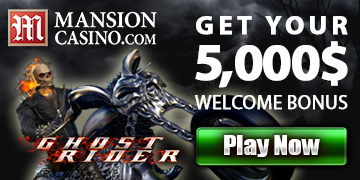 Check it out and if you have any questions – let me know! Thanks for this post, guys! 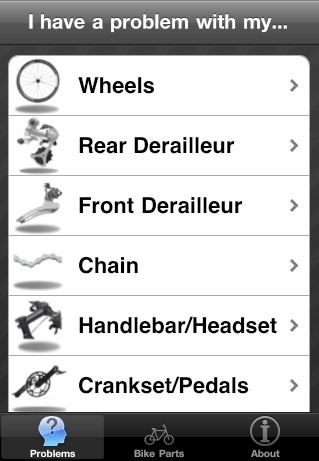 Looks like a helpful app – especially for me (mechanically-challenged). 😉 For less than the cost of a latte, I figure I can’t lose.